Nature Photonics wrote up a nice little article about the 50th anniversary of the laser diode last month, not to be confused with the 50th anniversary of the laser which happened in 2010. I know a lot about laser diodes. I sometimes feel I don't know nearly enough to be considered an expert, but I did co-author a book chapter and write a 210 page dissertation on my 5+ years designing and fabricating visible wavelength laser diodes, so I guess you could say that qualifies me to speak intelligently on the subject. 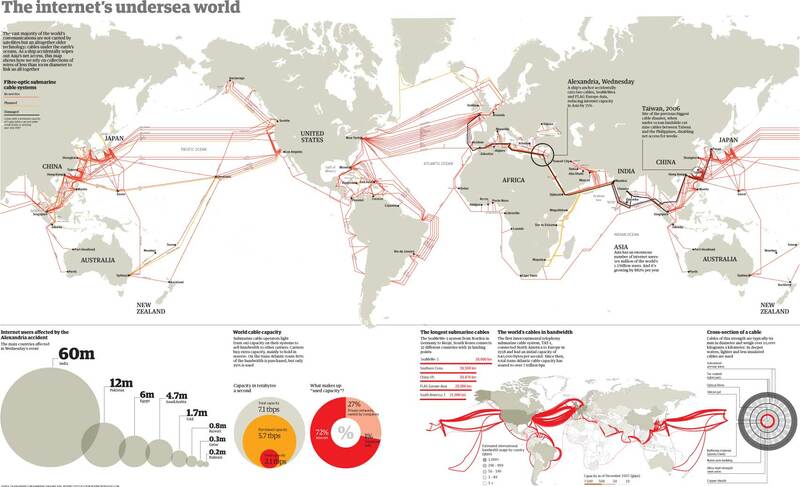 Still, when people ask me about my dissertation research, I struggle to explain it every time. Not many people know what a semiconductor is or what a laser diode is, or worse, they think they do but they don't. Laser diodes in particular are a source of confusion. The problem is that in order to understand my research project you need to understand some basic principles on solid state physics and crystallography, in addition to knowing what a laser diode is. They're not exactly simple concepts. In honor of the golden anniversary of the laser diode, I will finally attempt to explain what they are in simple terms. Behold! 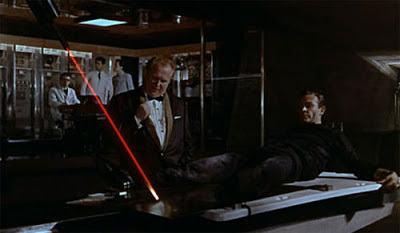 Most people hear the word "laser" and picture a huge death ray like in Goldfinger. They imagine I sit in a dimly lit lab, shooting high power laser beams all over and taking scientific measurements on them all day. Once in a while, some wise-guy will make an Austin Powers reference about putting them on sharks. This joke got old really fast. Alternatively, if they were alive in the 80's, someone might make a Real Genius joke about working with Lazlo or making popcorn, but this joke doesn't bother me as much because I love this movie. 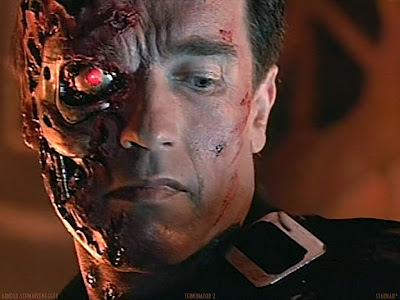 I used the word "optoelectronics" once to describe my area of research, which is a general term describing electrically-injected light emitters like laser diodes, and someone assumed that meant I worked on robotic eyeballs. Like in The Terminator, perhaps? To make things easier, most of the time I don't bother mentioning laser diodes at all and just tell people I work on LEDs instead. I occasionally work with LEDs and have many coworkers who specialize in them, so I happen to know a lot about them. Plus, there's that huge benefit of most people having a general idea of what LEDs are and what they're used for. My Grandma might think I make Christmas lights for a living, but I just decided that it's close enough. You literally need a microscope to see them. Typical dimensions of the lasers I work with are about one millimeter long and less than fifty microns wide, about the width of a human hair. Packaged green laser diode from European lighting giants OSRAM via Semiconductor Today. The rectangular chip is emitting green light, although it's difficult to see the actual laser beam. The wire bonds are used to inject current through the device. 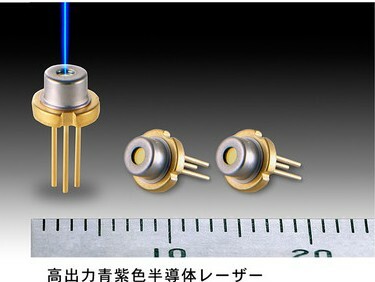 Fully packaged blue laser diodes from Sanyo. The scale is in mm. They're basically a glorified LED. 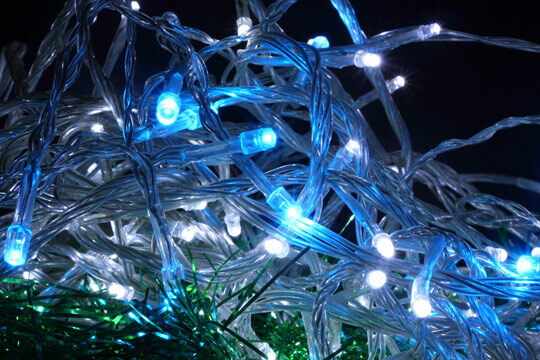 Light-emitting diodes (LEDs) and laser diodes both have the essential features of diodes, which means they flow current when you apply a voltage. To be specific, the LEDs and laser diodes I work with are p-n junction diodes. For these kinds of diodes we use a process called doping to turn a semiconductor material into n-type cathode material (more electrons) and p-type anode material (less electrons) and put them together like a sandwich. Here's Collin Cunningham of MAKE magazine talking about the history of diodes, including the p-n junction diode. In addition to being diodes, LEDs and laser diodes both produce light via similar magical mechanisms of quantum physics. This magic is contained in a layer in the middle of the p-n junction that has the ability to emit light. This light-emitting layer is also called the active region. One obvious difference between LEDs and laser diodes are their dimensions at the chip level. An LED chip or "die" is usually larger, square, and mostly emits light from the top. Generic square LED. Current flows from anode to cathode via a transparent contact and wire bond on the top of the sample and a contact at the bottom of the sample (not shown). The light generated in the magic light-emitting layer (a.k.a. the active region) and shines out the top of the sample. LED sizes vary but they are usually less than a mm wide. On the other hand, a laser diode is long and skinny and emits a concentrated beam of light from the edge. Generic edge-emitting laser diode. Like an LED, current flows from anode to cathode via a skinny metal contact and wire bond on the top of the sample and a contact at the bottom of the sample (not shown). The light generated in the magic light-emitting layer (a.k.a. the active region) shines out of the edge of the sample (technically both edges). In this example, only the area under the narrow metal contact of the anode generates current to produce the light which forms the laser beam. Keep in mind there are MANY different configurations of LEDs and laser diodes and I'm glossing over some other details, but these are just generalizations for simplicity sake. They have all the necessary components of an actual laser. That is to say that although laser diodes are small, they are still technically lasers and produce a tiny laser beam of light via the same mechanisms that all lasers operate. 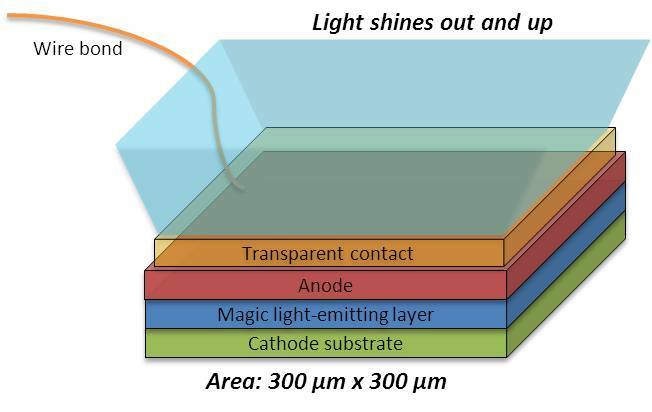 It is made from a material that can generate light via energy supplied from an external source (such as an applied voltage which causes current to flow through a magic light-emitting layer, in the case of a laser diode). The light is trapped in a cavity that allows the light to bounce back and forth inside. 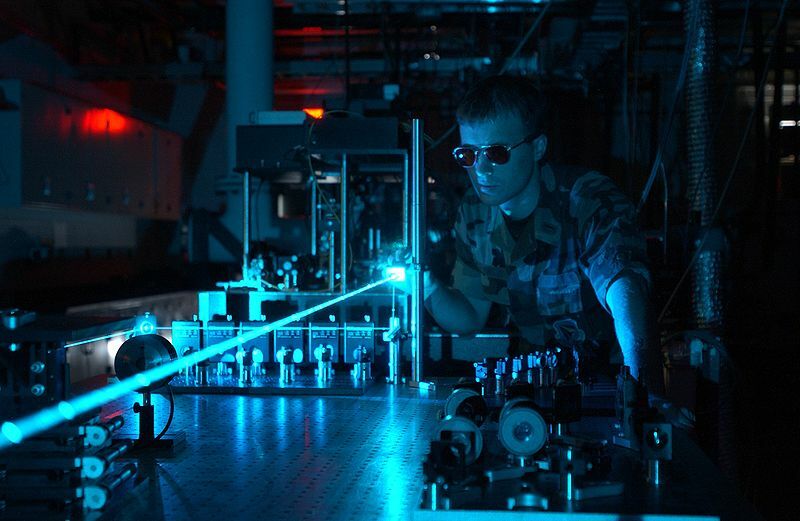 The reason lasers are long and skinny is because the light inside only needs to bounce back and forth in one direction. In our lasers, we trap the light in this long, skinny cavity by forming a thin ridge of metal via photolithography and coating the ends (or facets) with partially reflective mirror material. If you trap enough light in this long skinny cavity, the material within it-- which is already generating light-- can absorb more energy from the light that it itself created. This is how light begets light. When light begets light you have gain. This gain process is also called stimulated emission. It's something laser diodes do and LEDs do not. When you have this gain process happening within a laser, a funny thing happens to the light. This is the magic of lasers. The light gets really narrow in shape, forming a beam, and narrow in spectral width, which means it's all the same specific wavelength or color. Without the benefit of gain and stimulated emission, LEDs produce a much broader color output-- so an LED giving off blue light also gives off a little violet and green as well, but laser diode giving off blue light is a really specific color blue. 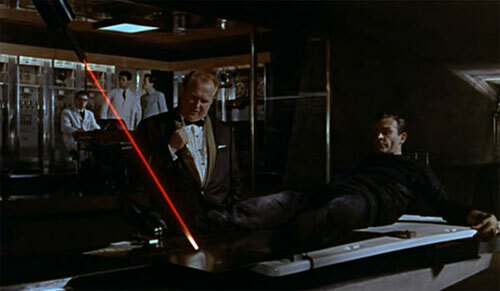 Here's Bill Hammack of the Engineer Guy describing how a ruby laser works. LEDs and laser diodes both flow current when you apply a voltage, and both magically produce light when the current flows through a layer called the active region. A laser diode is long and skinny and when enough light builds up, it magically forms a laser beam. What are laser diodes used for? CD and DVD technology - use red laser diodes to read and write data on disks. Blu-Ray technology - uses violet laser diodes to do the same thing, but since it has a shorter wavelength than red, that allows higher density of data per disk. Laser printing like LaserJet and digital photocopiers - uses IR (invisible) laser diodes to charge a rotating drum which then attracts toner/ink and rolls it onto paper. Bar-code readers - the thing that goes bloop when you buy things in a store. Laser pointers - do NOT shine them at airplanes. Laser-based projectors - you could use red, green and blue lasers to produce full color images that are always in focus. They are small and lightweight, you could even embed them in a cellphone. I grew the semiconductor layers (the anode, cathode, and magic light-emitting layer) and then fabricated them into tiny lasers and tested them in a lab. I spent a lot of time improving the growth, design and fabrication of the lasers, which meant working in several labs, including a lab where we grow semiconductor material via a process called metal organic chemical vapor deposition as well as a cleanroom to form the ridge and metal parts. I did not sit in a room full of lasers all day, although once in a while I sat in a room with a microscope and tested really really tiny ones. The whole point of my project was to show that the particular properties of the particular semiconductor I was working with could make more efficient laser diodes. Oh, and my lasers happened to be blue. Fun fact: This blog is named "My Laser Boyfriend" after an old joke about spending too much time making lasers and not enough time dating. But such is grad school.